The central component of apoptosis is a cascade of proteolytic enzymes called caspases. These enzymes participate in a series of reactions that are triggered in response to pro-apoptotic signals and result in the cleavage of protein substrates, causing the disassembly of the cell1. FLICA Apoptosis Detection Kits use a novel approach to detect active caspases. The methodology is based on a Fluorochrome Inhibitor of Caspases (FLICA). Once inside the cell, the FLICA inhibitor binds covalently to the active caspase2. These inhibitors are cell permeable and non-cytotoxic. For detection using green fluorescence, a carboxyfluorescein-labeled fluoromethyl ketone peptide inhibitor of caspases is used. Figure 1. Suspension cells were incubated with 1 mM staurosporine for 3 hours at 377C to induce apoptosis. Cells were then labeled with FAM-VAD-FMK (a generic FLICA probe which binds to many activated caspases) for 60 minutes at 377C. Cells were washed, then Hoechst stain was added and the cells were incubated for 5 minutes. Wet-mount slides were prepared and 2 photos were taken of the same cells. Caspase activity on the left (photo A) was detected using a band pass filter (excitation at 488 nm, emission at 520 nm). Nuclear staining by Hoechst stain on the right (photo B) was revealed using a UV-filter (excitation at 365 nm, emission at 480 nm). In Figure 1, photo A, only one cell appears green it is apoptotic and stained positive for poly caspase activity with the FAM-VAD-FMK reagent. The other cell, which is not visible, did not bind to the reagent and therefore is not apoptotic. The same cells, photographed at right under a different wavelength for Hoechst stain, appear blue. 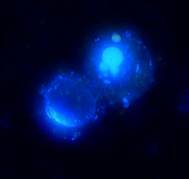 The cell in the top right of photo B (which appears green in photo A) has a very brightly stained nucleus its DNA is condensing in the cell, a sign it is dying. The cell in the bottom left of photo B (which is not visible in photo A) does not have a brightly stained nucleus, therefore it is neither apoptotic nor necrotic. Slee, E. A., C. Adrain, and S. J. Maritin. 1999. Serial Killers: ordering caspase activation events in apoptosis.Cell Death and Differ. 6:1067-1074.